The possible applications are mindboggling. Simple... RadMax radically reduces the unique part count, reducing manufacturing, assembly, inventory, and maintenance costs. Efficient... RadMax delivers better than 1 HP per pound of engine weight and more than 1.5 HP per cubic inch of engine displacement. Compact... RadMax engines, pumps and compressors are between 3 to 5 times smaller than comparable devices. Radmax devices will also weigh up to 3 times less than other engines, pumps or compressors of the same power rating. Powerful... RadMax's compact size and high output result in up to 6 times the size and weight-savings over a piston engine of the same horsepower. Smaller Carbon Footprint... RadMax devices are some of the lightest and most efficient ever designed. Not only are they more fuel efficient than comparable output devices, they require a lower manufacturing footprint. This means less material, shorter manufacturing timeframes, fewer man-hours, and less weight for shipping. 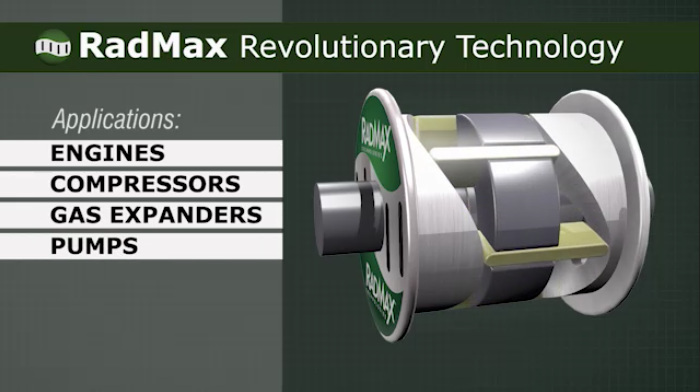 The RadMax Rotary Technology utilizes patented sliding vanes that move over a cam to compress gasses, move fluids or expand gasses to generate power from combustion or other high pressure sources of energy.